Will Hollywood Ever Be Accurate About Space? As a change of pace from Mars exploration mission architecture, and by popular demand - or, at any rate, the suggestion of regular commenter Geoffrey S H - a few thoughts on Hollywood and outer space. First, the short answer to the question posed in the title: Yes - when it has to be. That is, when the audience knows the reality, or at least has some notion of the reality, and would laugh at obvious faketude. Which will not be for some time to come - namely, when enough people are traveling in space for actual space footage to become a familiar commonplace. Until then, Hollywood will be completely indifferent to space realism. See this page at Atomic Rockets. Scroll down about halfway, to Hollywood Reasons. 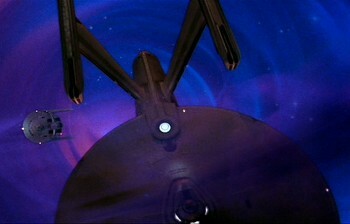 In principle, how real spacecraft maneuver should already be familiar. We have been performing successful rendezvous and docking maneuvers since 1965, meaning 46 years of impeccably realistic maneuvers by spacecraft in space, and in close proximity to each other. But so far as I'm aware, in none of these operations has a third spacecraft been handy nearby to film the maneuver from a photogenic angle. More to the point, rendezvous and docking is conceptually cool, but in purely visual terms it is only slightly more exciting than watching paint dry. The day may come when docking and undocking are standard bits of stock footage, used the same way snippets of an airliner pulling up to the gate are used, to convey arrival or departure of a character. But the time and attention given to such snippets will be minimal, unless justified by some plot complication - say, a squad of police in hot pursuit, trying to arrest someone before a departing ship undocks. In which case the whole scene will get a lot more attention. How accurate this attention will be is another matter. The scenario itself invites some interesting legal and practical questions. When a plane pulls away from the gate, or a ship from a pier, it is still within the jurisdiction of the airport or harbor - but once a spacecraft unlatches from a station, is it still within the station's jurisdiction? Enforcing jurisdiction has its own points of interest, but in any case, don't expect Hollywood to care, any more than most cop movies today care about what would really happen in equivalent situations. Anyway, space cops are a sideshow. Let's be honest: What you're really interested in is space battles. The usual Hollywood treatment of these, from Trek and Star Wars and on through various TV shows, is pretty risable. Space dreadnoughts fight at Trafalgar range, space fighters do barrel rolls and Immelmann turns, and an implausibly spectacular (and, especially, noisy) time is had by all. There are a few honorable exceptions - a silent rifle shot in Firefly, and most notably the Starfury fighters in Babylon 5, which sometimes actually maneuvered like spacecraft. How did they get away with that? I'll venture a two-part answer: First, the fliparound and retrofire maneuver is visually impressive and somewhat self-explanatory - you don't need to understand the underlying physics to appreciate its coolness. Second, J. Michael Straczynski, or someone in his development team, guessed that a small but significant part of the show's core audience would appreciate the maneuver and the logic behind it, and say "Way Cool!" Which would cue in other viewers that something way cool had just happened. Which is useful guidance on how to make similar effects appear again. You will never convince Hollywood to replace cool by non-cool for the sake of mere realism. You have to offer a cool alternative to the existing conventions. As one example, combat range. I can think of scenarios where spacecraft might start shooting at very close range (say, an exchange of prisoners/hostages goes pear shaped, or whatever). But most space combat situations imply Stupendous Range, or at least enormous range, certainly far too great for the rival combatants to both show visible details in the same frame. World War II newsreel footage already solved this problem: Good guy battleship shown firing toward the right, cut to bad guy battleship shown firing to the left. We know and understand this convention - but you still need to convince the director to forego showing both the Enterprise and the Klingon battlecruisers at once. My solution would be to use a handy moon as a prop. (It isn't like moons are hard to find out there.) Now you can have one ship firing in the direction of a distant moon - then cut to the other ship firing back, with the moon as a nearby planet-scape. Stupendous Range is instantly and vividly conveyed. Stepping back a bit, I should acknowledge that what exactly constitutes 'realistic' space combat is rather more complex and ambiguous than simply making a nod to Sir Isaac Newton. As has been previously discussed/argued about here on this blog, space warfare does not just involve physics; it also involves power politics and economics. In the Plausible Midfuture, at least, any space warfare is most likely to a) be fought between rival Earth powers, b) be confined almost exclusively in Earth orbital space, and c) involve only robotic or remote-piloted vehicles. None of which offers much place for space armadas, colonial rebellions, or other classic SF space warfare tropes. All of which having been said, we'd still be inclined to stand up and cheer for space battles that have even a superficial ring of plausibility. Good plot and characterization might also be helpful, but that is another discussion. The image, via Atomic Rockets, is a scene from The Wrath of Khan - concerning 'three-dimensional thinking' in a battle between spacecraft with a thoroughly two-dimensional aesthetic. My bias, as expressed last post, is for reaching Mars and returning on fast transfer orbits, making the one way trip in approximately three months. Allowing a few weeks on (or at least orbiting) Mars, the mission can be done in six months and change. The alternative is using Hohmann transfer orbits, more or less, and accepting an 18-month round trip. This can be done with chemfuel rockets, and broadly speaking we already know how to do that part. What we don't know is how to send humans into space for 18 months and get them back in good health. Six months corresponds to the currently accepted mission duration for the ISS. Going much longer will be much harder on the crew. On the other hand, the 'fast' six-month mission calls for an electric drive; even nuclear thermal comes up short. An electric drive with sufficient performance is semi-speculative. The Dawn probe has three (redundant) ion thrusters with a combined mass of 129 kg, thus 46 kg each, while its solar wings come in at 204 kg. Each thruster delivers 92 mN of thrust from 2600 watts of electric power. The combined mass of one thruster plus solar wings thus comes to 247 kg, just about 0.01 kW/kg. We need power performance about 100 times better, approaching the figure of merit I have often mentioned here, 1 kW/kg is the standard figure of merit. The reason for using this figure of merit shows up in sims done on the Rocketpunk Manifesto TravelPlanner. Specifically I looked at a baseline vehicle capable of putting on 29 km/s of delta v in 60 days of acceleration, allowing a 30-day coasting period. This is more efficient than a classical brachistochrone orbit, which expends energy and propellant on putting on speed, then (literally!) turning around and taking it back off again. Exhaust velocity is a little over 30 km/s, giving a mass ratio of 2.5: given a departure mass from Earth orbit of 250 tons, the 'dry' mass that reaches Mars orbit is 100 tons. Rated drive power is 15 megawatts. The propulsion system (thrusters and power supply combined) is allowed 50 tons, half the 'dry' mass of the ship. This corresponds to a power density of 0.29 kW/kg - or, putting it reciprocally, 3.45 kg of drive mass - thrusters and power supply - per kilowatt of drive power output. As a gearhead reference point that corresponds to 5.65 lbs per horsepower. I allow 30 tons for fuel tankage, keel structure, and general equipment. Which leaves just 20 tons for the gross payload - life support hab, stores, and crew. This ship is half engine, not a very balanced design. But this is what you need if drive power density is limited and you want to get to Mars in a few months. My math fu is not equal to the task of actually determining travel time to Mars for a given mission delta v. But this handy delta v calculator, can do it. According to the calculator, burns totaling 27.33 km/s of delta v are needed to get from a high (100,000 km) Earth orbit to low (500 km) Mars orbit in 90 days. The calculator assumes a brisk 10 milligees of acceleration. The sims have a much more modest acceleration, averaging half a milligee. (And if the drive is solar electric its acceleration performance will be halved at Mars distance from the Sun. Therefore the calculator estimate quite optimistic, but clever mission design could probably squeeze out some improvements. At least, to a first approximation, this provides some idea of what it takes to reach Mars in a few months. But the mission profile is for a one-way trip, implying that the vehicle must refuel at Mars orbit. One day this may be a routine operation, but it will certainly not be routine the first time. Really we should be capable of a round trip with onboard propellant - requiring twice the mission delta v, about 55 km/s. A second sim shows a lighter and more powerful drive engine, close to the 1 kW/kg figure of merit, putting out 30 megawatts and providing twice the specific impulse. This more powerful engine has a mass of 30 tons, allowing 40 tons gross payload. Realistically speaking this is close to the minimum performance requirement for a practical Mars craft - which is why 1 kW/kg is regarded as the figure of merit for fast space propulsion. This spacecraft is strictly a crew transfer vehicle, intended to get the crew from high Earth orbit to low Mars orbit and back. Electric drive is completely unsuited to planetary landings, so any mission profile like Mars Direct is ruled out. Everything needed to land on Mars, live and work there for a time, and return to Mars orbit, can be sent on a slow orbit. 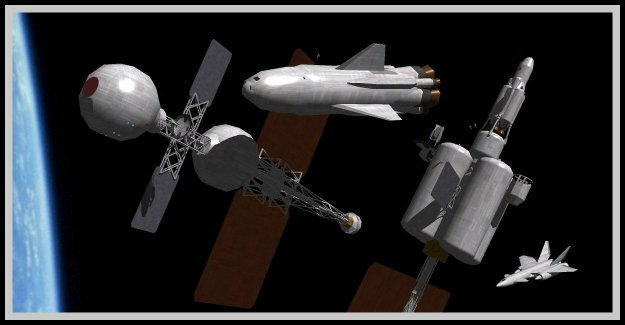 Since the mission departs from high Earth orbit, there must be a prior phase in which the ship, assembled in low orbit, spirals out, then is met by a crew ferry. In principle the ship could return to high Earth orbit and be met there. More likely at least on early missions, the payload will include an Earth return capsule for the crew (and samples of Mars material), with the interplanetary bus being expended. This post is conceptually quite incomplete - really it only talks about the interplanetary bus. But I want to get it posted, so here it is. 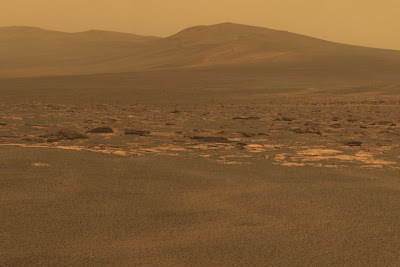 The image of Mars' surface is from Astronomy Picture of the Day. The first human interplanetary mission will, more likely than not, go to the Red Planet. Apart from the Moon it is the easiest major body in the Solar System for us to reach. Its surface bears evidence of rivers and seas, and liquid water may still occasionally flow there. 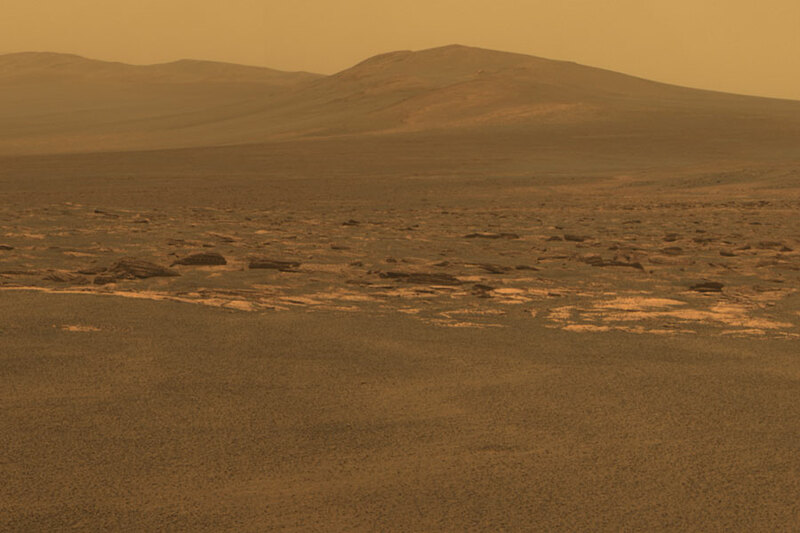 The similarity of its landscapes to the American Southwest is an illusion, but it remains a candidate for life, and its chief rivals - Europa and Titan - are far more distant and hard to reach. A single image (of an artifact, for example) could of course change all this. But for now at least, Mars is the likely first place to go. I am not concerned with pure stunt missions, whether by some multi-billionaire or an emergent great power. For this discussion I presume that a human mission to Mars is intended to explore Mars. Yes, other motivations will surely be in the background, involving the usual suspects. But the more serious the exploratory intent, the more likely that going to Mars will lead to further developments rather than end up as a costly one-off. This does not mean that every individual mission must 'do science.' The engineering demands of safe human interplanetary travel justify what amount to shakedown missions, say, a manned flyby that does nothing but demonstrate our ability to perform the transfer mission. But the program as a whole should be aimed at advancing our knowledge of Mars. The model here is not Apollo but the robotic deep space program, which in spite of some embarrassing failures (feet/second != meters/second), has in all been a profound success. A first implication is that a human mission will be undertaken only when robotic missions reach diminishing returns. It is no doubt true that a geologist with a hammer could learn more about Mars in a day than our rovers have learned over years. But the cost of sending that geologist would be very much greater than the next few rovers. And human missions are subject to some constraints, such as landing where it is safe to land. My instinct in thinking about a Mars program is to proceed cautiously and incrementally - unmanned tests of the vehicle, then a human flyby, then orbit without landing, and only then a full-on landing. I am not sure that each of these stage is strictly necessary, and there are alternate possibilities, such as a visit to a NEO, that would similarly exercise spacecraft and procedures. And some of these missions - notably, orbiting without landing - might be able to 'do science' on an important and relevant scale. In particular, a crew on Mars orbit can operate surface vehicles and manipulators remotely, but without significant light lag - like steering a minisub from the surface, not steering a rover from Pasadena. This is as good a place as any to note that 'going to Mars' combines at least two very distinct space missions: the deep space journey to Mars orbit and back, lasting at least months and perhaps most of two years; and landing on Mars, working there for weeks, and lifting back off to Mars orbit. This in itself is reason to test the Mars orbital capability before the surface landing. Mars Direct argues in effect for a very different functional division - in effect a one way trip to the surface of Mars, then use of a second pre-positioned (and pre-fueled) spacecraft for the trip back. This feels cut-rate and precarious to me, not least because Zubrin is so much like a real estate promoter, not quite trustworthy on principle. To be sure, there's no reason this architecture couldn't be tested in an unmanned mission, but I also have doubts about packing the hab elements into form factors suited to Mars landing and liftoff. It seems like awfully cramped crew quarters for such a long mission, or else a much larger cabin than you need to carry the crew and some rock samples from the surface to Mars orbit. In any case, as longtime readers know, I have bias in favor of fast human travel using high ISP propulsion - most likely solar electric, though perhaps nuclear electric - for getting to Mars orbit and back. Faster travel means less exposure to radiation and weightlessness, the main health hazards of prolonged spaceflight. Solar electric has now been successfully flight tested by the Dawn mission. A fast (~3 month) trip to Mars requires a much higher drive power/mass ratio, which may not be attainable. But solar electric space propulsion is far from technical maturity, and it may well be able to approach the 1 kg/kW standard for fast travel. .
Electric drive pretty much precludes the Mars Direct approach anyway, since an electric spacecraft is ill-suited to aerobraking, and doesn't need it. The surface components of the mission can be sent separately - a Hohmann transfer is fine, since the crew isn't aboard until the Mars landing. 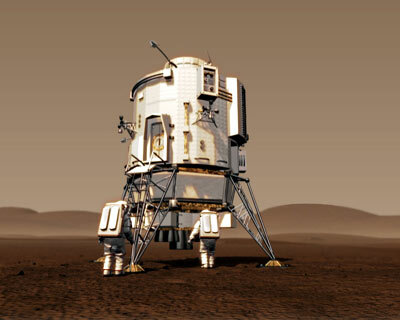 The image, from a European proposal for Mars exploration, is recycled from an earlier post on interplanetary exploration.